Deciding to take a pet into your home can be a serious commitment and requires careful consideration. Extra cost, integrating the pet into your living arrangements and exercise requirements are just some of the points to take into account. One of the problems often encountered with pet ownership is that people underestimate the commitment and responsibility associated with this important task. An option that more and more people are starting to consider is greyhound adoption. 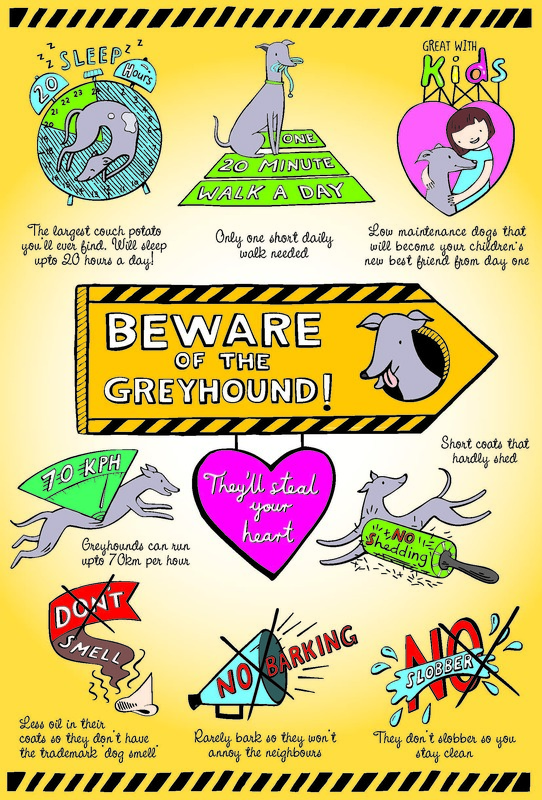 The purpose of this infographic from our friends over at Greyhounds as Pets is to educate potential dog owners on the many benefits that adopting a greyhound as a pet entails, such as: lack of shedding, their suitability to environments with children, and convenient sleeping patterns. One of the greatest attractions is the option to take the greyhound on a trial period, enabling prospective owners to analyse the suitability of their homes to the pet, and to gauge their relationship with children or other occupants of the home.